Shoviv PST Upgrade and Downgrade Software works with all versions of MS Outlook 2016, 2013, 2010 and all lower versions of MS outlook. PST Upgrade software provides easy Graphic users interface for users. The Software helps the user to maintain proper folder hierarchy. PST Upgrade and Downgrade tool works with all windows like: 97, 98, XP, Win7, Win8 and Win10 etc. PST Upgrade and Downgrade tool Software provides trial version of this PST Upgrade tool for the satisfaction of the users. Those users who are interested in this tool they can try the trial version of PST upgrade and Downgrade tool before buying PST Downgrade and Upgrade full version tool. 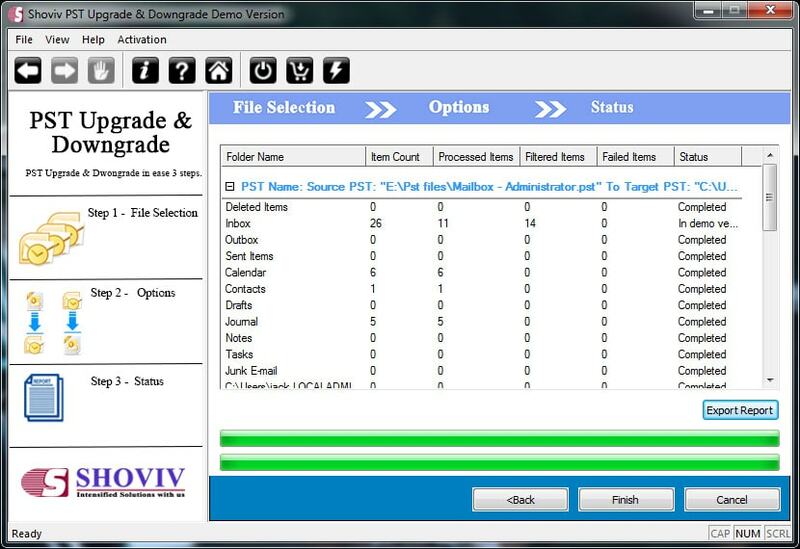 This trial version allows users to Upgrade or Downgrade first 25 items per folders. If users want to know more about the tool or having any queries about the product then they can contact our technical support team of Shoviv Software Pvt. Ltd. The team is 24*7 available and happy to help you. Total PST Repair Tool to perform recovery of deleted Emails data & repair highly corruption of Outlook PST file. The Software also provides multiple file formats like PST, EML, MSG to export recovered data.